Introducing the new Comprima Round Baler from Krone North America. Customers are really going to like the “new-look” Krone 2018 Comprima Round Baler—the only round baler offering the exclusive Krone belt and slat system for building superior, denser bales in any crop, from straw, to dry hay, to wet hay for silage bales (baleage). This Comprima features a new camless pick-up design that delivers better feeding and less wrapping, resulting in more uniform-shaped bales. Like earlier models, this Comprima offers the capacity for those who want to bale more tonnage per day. This new Comprima offers Krone-backed reliability, as it comes with a FREE 3-year/30,000 bale warranty on the exclusive Krone NovoGrip™ belt and slat system. Growers can expect Cutting Edge™ Hay Quality, thanks to Comprima’s ability to build higher density bales, particularly ideal for silage bales. Choose from a variety of bale chamber sizes in both fixed, variable, and the Krone exclusive semi-variable model. 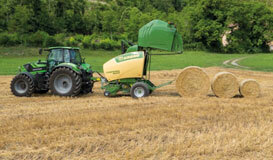 Visit krone-na.com for more information, and to find the Krone dealer nearest you. Krone—over a century-old, family-owned and operated business based in Spelle, Germany—has been providing customers with premium-quality, Cutting Edge™ hay and forage equipment in North America for over 45 years.